Learn more about the airport’s story. Sacramento International Airport (SMF) is your gateway between Northern California destinations and major cities across the U.S. and the world. Located 12 miles from downtown Sacramento and always open, service is available from 12 major carriers. Sacramento International Airport opened October 21, 1967, as Sacramento Metropolitan Airport. Prior to this date, all commercial airline flights through the Sacramento region were handled at the current site of Sacramento Executive Airport, formerly known as Sacramento Municipal Airport. In 1957, the proposed construction of Sacramento Metropolitan Airport and purchase of nearly 6,000 acres north of downtown Sacramento was considered extravagant. The plan was deemed risky, the site poorly located and the size based on unrealistic passenger expectations. The skeptics were wrong. The original estimate of 750,000 annual passengers soon proved to be conservative. The airport surpassed one million passengers during its first year of operation. Upon opening in 1967, Sacramento Metropolitan Airport was the first public use airport west of the Mississippi that had been built completely from the ground up. 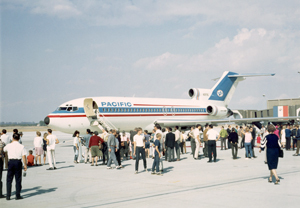 The airport was initially served by five airlines: Pacific, PSA, United, Western, and West Coast. The 1980s ushered in a new era of construction and growth. During this time, new developments included: the in-flight catering facility (1980), an FAA Flight Inspection Field Office (1985), a second air cargo facility (1985), and the east runway (1987). The east runway’s opening was celebrated by the landing of a Concorde. America West, Continental, Morris Air and American Eagle Airlines joined the original carriers at Sacramento Metropolitan Airport during this time. In the 1990s, the consolidated rental car terminal and Terminal A opened (1998). Meanwhile, passenger traffic continued to grow. 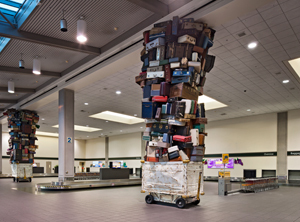 Sacramento Metropolitan received a new name – Sacramento International Airport. The consolidated rental car terminal, the first of its kind in the nation, placed all rental car companies in one building that was serviced by airport-run shuttles. This innovation streamlined bus operations to reduce congestion at the terminal curbs and improve air quality while also enhancing overall customer service. Over the years, advances in technology changed how the airport shared information with its customers. The Sacramento County Airport System launched its first web site in April 1997. During this time, airline service also changed. Southwest (1991), Alaska (1993), Horizon (1993), and TWA (1994) were added to the list of carriers serving Sacramento. Southwest and Alaska Airlines experienced rapid growth, offsetting the departure or cessation of operations of airlines other airlines. The new millennium ushered in even more changes, none more significant than those following September 11, 2001. Airport security procedures were forever changed by the tragic events of that day. The newly-formed Department of Homeland Security and Transportation Security Administration were created and sweeping changes were implemented to improve aviation security. Despite the immediate effects on air travel, September 11 did not deter growth at Sacramento International Airport. Four new airlines were soon added to Sacramento International: Continental returned (2000) and Frontier (2002), Mexicana (2002), Hawaiian (2002), and Aloha Airlines (2003) initiated service. Mexicana’s arrival initiated international nonstop service and necessitated completion of the International Arrivals Building for the federal inspection services prior to the first international arrival at Sacramento International Airport. Sacramento County Airport System paid for customs service until 2006, when Sacramento was designated as an official "port of entry." The new parking garage opened September 23, 2004 to rave reviews. The six-story structure offered covered parking, a short walk to the terminal and public art (“Flying Gardens” by Dennis Oppenheim and “Flying Carpet” by Seyed Alavi). As of October 6, 2011, the parking structure connects to both Terminals A & B. In 2006, Sacramento International Airport became one of the first airports in the nation to offer free wireless Internet service (WiFi) to its customers. 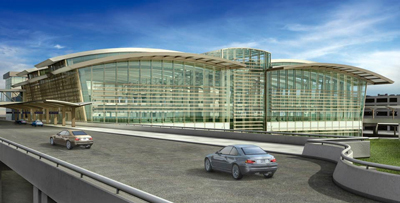 In 2008, the Sacramento County Airport System broke ground on the largest capital improvement project in the history of Sacramento County: “The Big Build.” The $1.03 billion terminal modernization project replaced the airport’s original, aging Terminal B to meet the rising demand for passenger services and improve the airport’s ability to attract new carriers and routes. The Terminal B facility is three times the size of the original Terminal B. The two parts of the complex – an airside concourse and a landside terminal - are connected by an automated people mover. As the nation’s economy was taking a hard hit in 2008, commercial aviation was challenged by reduced passenger numbers and increased fuel prices and other operating costs. Express Jet, Aloha and Mexicana ceased operation within the span of two years. America West, Northwest and US Airways merged and United and Continental initiated their merger by the end of 2011. Despite these challenges, Alaska satisfied demand by adding nonstop service to Mexico and Hawaii while Aeromexico’s (2011) debut reestablished foreign-flag service with nonstop service to Mexico. In September and October 2011, the County Airport System celebrated the opening of the new Terminal B with a series of special events, culminating in the Experience B party on October 1, 2011. More than 1400 friends of the airport attended the event. The airport hosted a full-day free preview for 4,500 more visitors on October 2, 2011. The first flight departed in the early morning hours of October 6, 2011. As of August 2012, demolition of the old Terminal B and new pavement for overnight aircraft parking are complete. The finishing touches, including pavement striping and landscaping, were completed in fall 2012. The future of Sacramento International Airport is bright. A new 20-year Master Plan process began in 2012. Be sure to visit our news and planning pages for the latest information.